This app is both my dream and my nightmare. I love learning languages, and anything that enables me to understand and communicate in more of them is a fantastic tool. On the other hand, if tools like this get too good, my life’s work (as a creator of English language courses and resources) – and my future income – will be wiped out with a few swipes of a touchscreen. 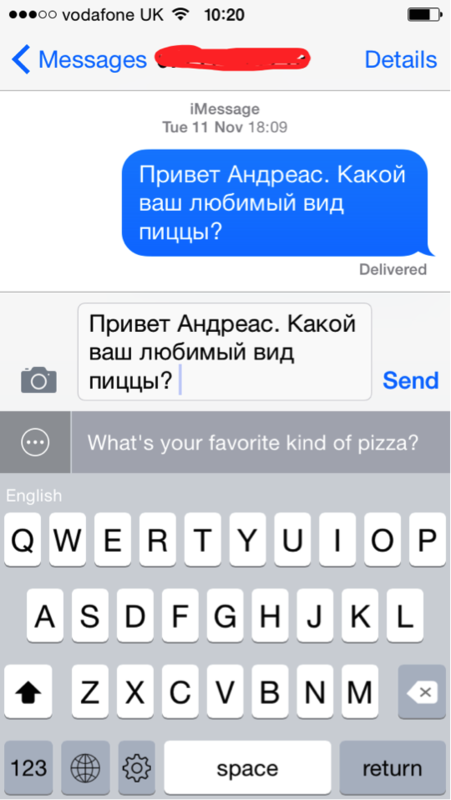 Slated is a translating keyboard extension for iOS 8 by Gist LLC. Its simple (and not particularly informative) website presents it as the perfect way to impress foreigners by flirting with them in their native language. This amused me because it chimes with my pet theory that humans will stop learning each other’s languages once translation software becomes sophisticated enough that we can have successful romantic relationships with others despite not speaking the same language as them. Imagine it: those clunky Google glasses replaced by a stylish ear clip or wristband which simultaneously translates every sweet nothing your holiday crush whispers into your ear. Bye bye verb tables and parlez-vous français: bonjour mon amour! You think I’m joking? Companies like Translate Your World are already melding voice recognition software and audio data sets to form a serious simultaneous translation tool for business. The results are clunky – you wouldn’t use it as a seduction aid – but it’s surely only a matter of time before these tools get significantly better, significantly smaller and more portable. Getting to the important questions in Russian. But in the meantime, at £2.99, Slated is a relatively cheap way to start text messaging your friends in other languages – 80 in total. The installation process is a little confusing, and I spent a good 10 minutes figuring out how to get it to work. It needs to be installed as a separate keyboard, and as I already have English, Norwegian, French and Spanish keyboard installed, that meant I had to cycle through these in order to get to the Slated keyboard. Once it’s set up, you can select from the list of available languages and then start typing your SMS, iMessage, Facebook chat and so on as normal. The translator then does its thing (provided that you are connected to the internet). You can see your text being translated in real time in another field below the original version. Here’s where I hit the first snag. 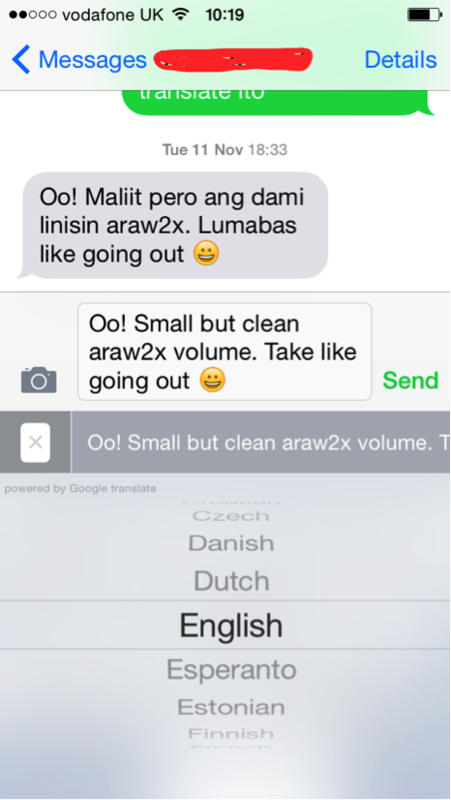 Once you’ve typed your message and seen the translation, your overriding instinct is to hit the Send button, but this just sends the English version – you need to remember to tap the translation to move it into the correct field. Not such a big issue once you get used to the interface but I forgot time and time again, and became frustrated that my neat little translations weren’t going anywhere and my interlocutors were receiving messages in boring old English! I also found the app extremely buggy – sometimes it wouldn’t translate anything, sometimes it froze, sometimes it would translate one sentence but not another. Fairly standard behaviour from a new release app, but with a price tag of £2.99, I’d have expected them to release something a little more well-developed. Hopefully future updates will smooth over these initial problems. Another issue for me is that the iPhone’s autocorrect function was disabled while I was using the Slated keyboard, and for someone with clumsy fingers like me this is a disaster, as around 50% of the words I type need to be autocorrected. I tested it with five different languages: Hindi, Japanese, Russian, Tagalog and Norwegian. With the first four, I tried it with native speakers or near-fluent speakers of the languages, and in each case they were very impressed with the results. I sent them quite convoluted messages ‘the quick brown fox jumped over the lazy dog’, and although they didn’t recognise this common English phrase they were able (mostly) to translate it as it was written. With Norwegian I judged the translations against my own intermediate understanding and found them to be pretty much what I had predicted. Translating back from the target language to English was a little less successful, at least with Tagalog, and there were a few exchanges which left me baffled. The main thing to note about Slated is that it is ‘powered by’ Google Translate. In other words, it’s a wrapper which runs a live search through Google Translate every time you use it. Now Google Translate is easily my most used language app. I have it open as a tab on my browser all day every day, and use it to translate between multiple languages as I go about my work and studies. It’s distinctly better at translating between certain languages than others, but it’s generally possible to get the gist of any piece of text, and in many cases (especially with simple sentences), a fairly accurate translation. Google Translate works by running searches of its own and detecting patterns in documents it finds online. Its disadvantages are the ones you would expect – it’s better at translating written language than speech, and it can give literal translations when meaning is ambiguous. That said, it’s a fantastic tool (provided you speak one of the 81 languages it features), and I barely go more than a few hours in a day without turning to it. Which brings me to my main issue with Slated; when you compare it to Google Translate, it isn’t adding much in terms of functionality. In fact, I’d argue that it’s actually significantly harder to use. If I’m chatting to a Norwegian friend on Facebook or What’s App and I’m not 100% sure of the correct way to say what I want, I’ll cut and paste the text into my Google Translate app, check the result and then cut and paste the translation back into the original conversation. Provided I’m online, the process is extremely quick, whereas with Slated the process takes longer because I need to first select the right keyboard and then compensate for the buggy performance. That said, I’ve only been using it for a week, and if I were using it to communicate regularly, no doubt I would get much faster with it. Overall verdict? If you communicate regularly via text chat with someone who speaks another language, this is going to be a very helpful app for you. For the rest of us, the Google Translate app (which is free) does a mighty fine job already. And as far as serious simultaneous translation goes, us language teachers still have a job… for now. Kirsten has been teaching and creating courses and materials for ELT for nearly 15 years. She has written textbooks for Harper Collins, created a best-selling ELT videogame for Pearson, and is currently Head of Learning for EduMe, a startup which creates mobile learning apps for Africa and Latin America. You state in your introduction that if this kind of technology gets too good, the language teaching industry will be destroyed. I can’t quite make out if you are seriously suggesting that this could ever happen? I think there are plenty of reasons why no matter how good the technology got it still wouldn’t be practical to use in most contexts. To be honest, Thomas, I’ve been entertaining similar thoughts. Microsoft have developed a simultaneous voice translator, which is pretty impressive now, and it will only get better and better. If Mitra can reasonably posit that calculators make the study of long division redundant, then the same logic could be applied to languages. This is not to say that I agree with this, though, rather that we may see some impact on attitudes to second language acquisition. Hi Thomas. My point is slightly tongue in cheek – I think the language teaching industry will flourish for a while longer. However, in the long term I am quite serious in my belief that machine translation will improve sufficiently to render learning languages a waste of time for many people (although probably not all). Do I think a machine will ever translate natural language perfectly? Probably not. And I think in situations where precise, reliable translations are essential, it will take several generations before it gets good enough, if it ever does. But a great deal of communication between speakers of different languages doesn’t require anything close to a perfect fluency, or a grasp of idiom or metaphor – for those types of exchange, I think it’s highly probably that machine translation will get good enough to bridge the gap. I hope people will want to continue learning languages though, and I’m sure that many will. From what I see from Google Translate at the present time, its ability to manage East Asian languages from and to Germanic languages is woefully poor. A back-translation proves this time and time again. It is improving, but not at a pace, as I see it, that anyone needs to fear an app-invasion into the need for additional language acquisition at any point soon. Google Translate has been around long enough, and its access to content to do it the way you describe so extensive, that were it able to get good enough to threaten the need for language acquisition, or human translation, is another half century away at least. I’d posit it will never get there. All languages have idioms and too much nuance, which do also change over time, meaning GT and any app that uses its resources, will always be playing catch up from what is a very long way away. Sure, French to Spanish it can do quite OK. But so would two people speaking French and Spanish to each other. Hi d!ddy. I’ve been looking into this a little more, and it looks like Google Translate has the potential to improve hugely provided it can access sufficient data sets. Because it works by analysing patterns in existing documents, rather than using rule-based analysis, what it needs in order to improve is access to more patterns. The reason it’s so good at translating European languages into other European languages is partly because many of them are similar in structure, but also because it has access to reams of European community translated documents. In order to get better at translating European languages into Asian languages, it would need more documents in the target languages and more documents which have been already translated by humans. So if such data can be made available, we have every reason to assume GT is going to get a lot better soon. Good review, hadn’t heard of this app until now, but as a frequent user of translating services Ill def look into it. However, Ive always found every service/app/site to be imperfect and therefore best used as a supplemental aid, meaning it will help me get my point across but shouldnt be relied upon for perfect translations. Luckily, I think we still have a good bit of time until that happens, but when the times comes that I can stick an earpiece in my ear and a patch on my vocal cords to speak and hear as a native, I will probably sign up! Hi, Kirsten. I work for a school district that is in immediate need of a translation tool for a 4th grade student who speaks only Arabic. We are looking into any and all avenues of communication with him, and I ran across info on Slated. Am I correct in assuming that the app will also let Arabic speakers type in their native language and then translate it into English, so he can communicate with teachers? Also, if you or your readers have any other suggestions, they’d be greatly appreciated! Hi Melinda. Yes, you are correct, it would let your student type in Arabic and then see the translation of his words in English. Note that the app costs a few dollars. You can also try the Google Translate app for free, but it isn’t so convenient if you want to use SMS or What’sApp etc to communicate with your student. Good luck! I emailed back in January about whether an Arabic-speaking student would be able to use this app to communicate with his teachers, because at the moment none of the other translation apps offer an Arabic keyboard. In fact, we purchased a voice/type translation app, but when it switches for the Arabic speaker, it still gives an English keyboard! WHen I first emailed, I was told than an upgrade was in the works that would provide an Arabic keyboard. I put in the request for my school district to purchase Slated, which at the time was 99 cents. By the time the purchase order was approved and pushed through, and the computer services people generated the codes to get the apps I requested, the price had risen to $7.99. My question is this–will it ever be offered at the 99 cent price again? Hi Melinda. I don’t work for Slated, so I don’t have any info on their pricing, unfortunately. I recommend that you contact them directly or via the app store and ask if they would consider a discount for educators. I suspect they have no idea that their app is potentially useful to educators like yourself, so hopefully they will be receptive to your query. Good luck!